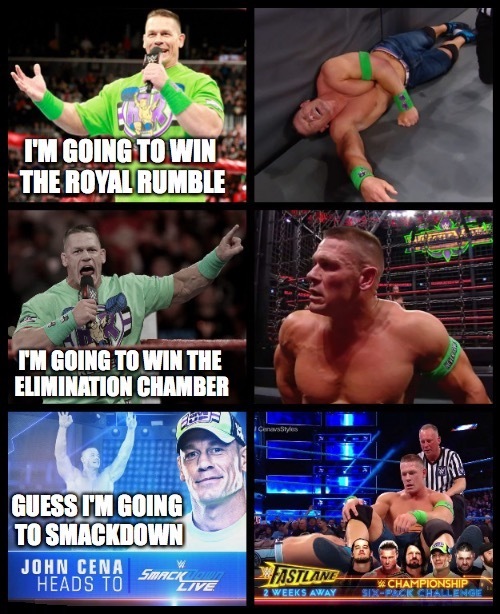 After failing on the Raw brand, will John Cena’s SmackDown path lead him to WrestleMania or will he have to resort to drastic measures? This entry was posted in Podcasts and tagged AJ Styles, Brandon, Brock Lesnar, Brooklyn, Bryan, Bullet Club, Cena, Cesaro, Champion, Chris, Daniel Bryan, Dolph Ziggler, Facebook, Independent Wrestling, Japan, John Cena, Kane, Kayfabe, Lesnar, Long Island, Madison Square Garden, March, Markin' Out, Monday, MSG, New Japan Pro Wrestling, New Year, New Year's Day, New Year's Eve, New Years, New York, NJPW, NXT, NYE, podcast, PPV, Pro Wrestling Tees, Raw, Recap, Results, Ring Of Honor, ROH, Royal, Royal Rumble, Rumble, Ryder, Ryder Revolution, RyderMania, Shane McMahon, Sports Entertainment, Styles, SummerSlam, Survivor Series, Taylor Swift, Twitter, USA, winter, World Wrestling Entertainment, WrestleMania, wrestling, WWE, WWE Network, WWENXT, WWWYKI, Wyatt, Wyatt Family, Zack Ryder by Brandon. Bookmark the permalink. Really enjoyed the episode. This is a bit of a generic question, but if you had to pick a Mount Rushmore of modern day pro wrestling (whether it be strictly WWE or including indies) who would you include?